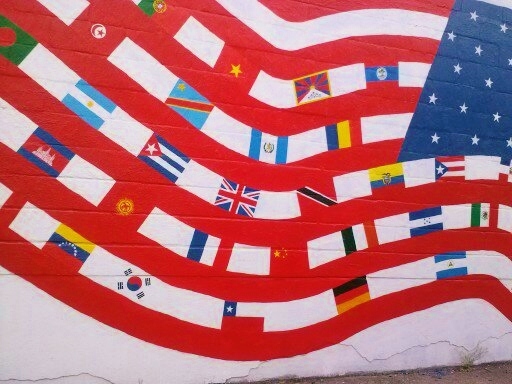 Brooklyn’s population is diverse and international. Actors from different origins performed their own stories on street corners and fire escapes, in different languages. On the L line above ground at Jefferson street, a performer emerged from the top of a building and another from street level. Climbing toward one another, the actors shared their visions of “Borders” calling out in Spanish and in English about forces beyond their control that keep them from being with those they love. Their performance crossed the street, traffic forming a barrier as a prop to the story. A block further down the a street, a beautiful young actor recited poetry of Frederico Garcia Lorca. She danced and along the sidewalk as she acted out the poem, with fifty people trailing along behind, watching her. She shed a long shirt, used as a prop to symbolize a man she had lost, and gathered long stem red carnations as symbols of lost loves. 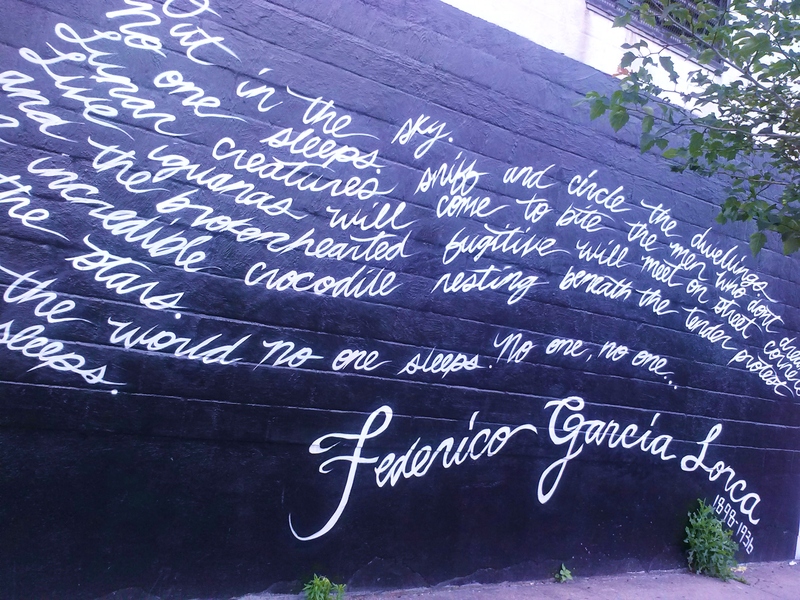 She ended her poem sitting motionless under a street art mural of a Lorca poem. Children from the neighborhood were enchanted, and followed the walking art tour on bicycles. A performing troupe of women created a human “wall” emerging from a basement stairwell and climbing up to the street. They struggled without words, forming barriers for one another. In the middle of their act, a local resident emerged from his apartment, guitar case in hand, surprised – and went on his way. Their final act was to break the barrier of bodies, simply by silently walking around the human wall without conflict. These were only a taste of what is happening hidden in the studios, and I’m looking forward to seeing more over the summer. 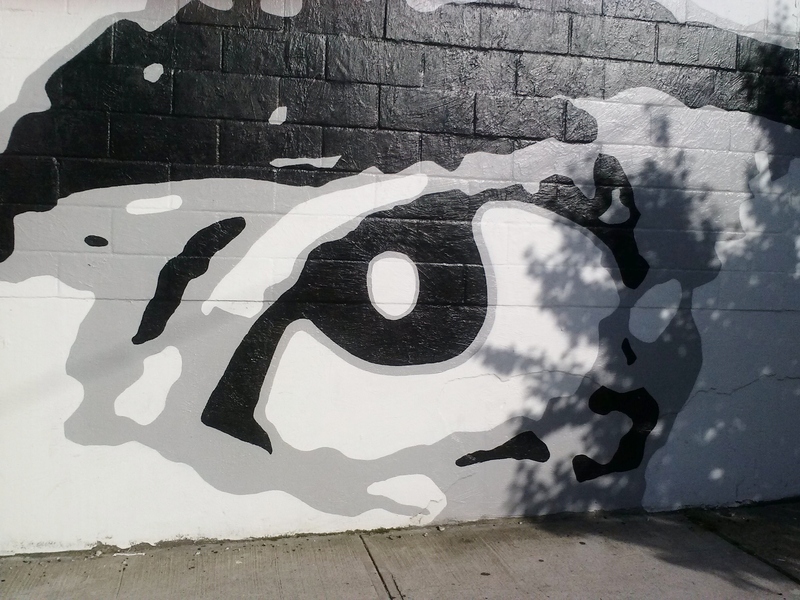 Do the artists in your community come outside in the summer? Please share a comment, I’ll look forward to reading about what you see. In Kansas City, MO fiber artist Alison Heryer is supplying 5×5 white canvases to parents and their children who gather in parks to print, paint, splatter or write on them with red paint. On July 15, 200 canvases will be placed in checker board fashion with solid red canvases to form a giant picnic blanket on the grounds of the Nelson Gallery of Art. After that each painted canvas will be returned to its creator.